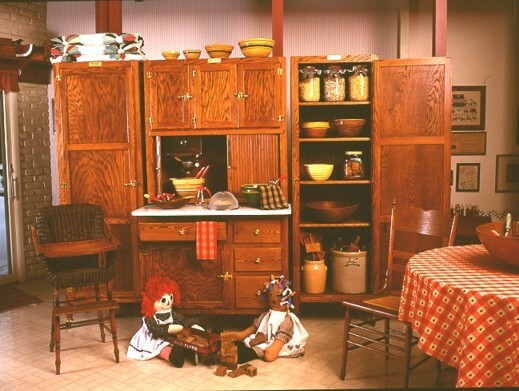 Hoosier Side Cabinets - The perfect addition to your Hoosier Cabinet! Similar to the original Hoosier side cabinets, these matching cabinets feature four adjustable shelves and provide nearly 15.5 cubic feet of storage space per cabinet! 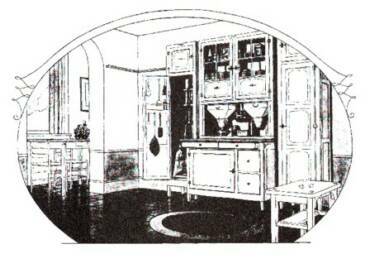 Our Hoosier side cabinets were designed to match the Hoosier Beauty cabinet perfectly. From the dimensions to the construction style to the brass leg skirts, ant traps and wooden casters! Nothing says "Country Charm" like a wall full of matching Hoosier Cabinets! Pricing: $775 each with Hoosier Cabinet Purchase, $800 each without. Like it? We could custom build it for you! See our custom building page! Side Cabinet Dimensions: 75 3/4" High, 24" Wide, 16" Deep - When combined, two side cabinets and a Hoosier cabinets fill a 96" wall!